Futaba Sachino (Rie Miyazawa) lives with her daughter Azumi (Hana Sugisaki). The bathhouse they used to run is now closed after her husband (Joe Odagiri) ‘vanished like steam’ a year ago. When Futaba is given a devastating diagnosis of terminal cancer she goes to find her former partner, who is now living alone with his daughter Ayuko. The two come to live with Futaba and Azumi and they re-open the bathhouse. With little time left Futaba endeavors to set her affairs in order, uncovering a family secret and making sure that the two girls are taken care of. Written and directed by Ryota Nakano, “Her Love Boils Bathwater” is a poignant yet uplifting story about the value of kindness. There are as many moments to make you smile as to weep and it treads a delicate balance between sentimentality and realism. All of the characters are given a backstory, however small, and the script does a good job of weaving together various subplots into a coherent narrative. The entire cast do an admirable job of creating believable family dynamics. Rie Miyazawa is a caring and compassionate mother dealing with the shock of her sudden illness. Remaining strong for her children, while displaying an inner turmoil and sense of loss, the character of Futaba provokes real empathy and love for her determination. Hana Sugisaki shines as Azumi, dealing with her own problems at school and later taking on responsibilities for many of the other characters. She is a mirror to Miyazawa’s kindness and strong-willed nature, while also retaining an independent spirit. Out of all the characters she undergoes the greatest journey, from shy and awkward schoolgirl to a confident surrogate mother to her family. The rest of the cast are all excellent, particularly Aoi Ito as Ayuko, who does an incredible job with very emotionally challenging material. The direction of the film is good, allowing the actor’s performances to shine. There is interesting use of cut-aways, to the chimney of the bathhouse, which may also resemble a crematorium chimney, or blue skies with clouds floating by. Discussion of the afterlife in the film is minimal, largely revolving around one young character whose mother is deceased. Religious notions are largely superceded, explicitly at the end, by a more humanist philosophy amongst the characters, that the reality of everyday love and joy is something that should be cherished over a belief in heaven. “Her Love Boils Bathwater” is a moving portrait about life and family set against the backdrop of an imminent death. This prognosis early in the film sets everything in context for the audience, although certain characters remain unaware of it until later. However, it is not a film that dwells on death so much as an examination of the joy of life. Although there are powerfully emotional scenes, there is also a lot of subtle humour and tender moments between mother and daughter or the two sisters that emphasize the idea that life is precious and each moment has the potential for joy. The film features several characters who are without a mother, though cared for by other characters. The importance of parental affection from those other than the biological parents is an important theme. This is generalized more widely into the notion of the paramount importance of kindness in society. Futaba’s relations with everyone she meets are typified by this more than anything, her ability to forgive, and her resolve to keep going through adversity. In the final section of the film we see this kindness repaid by those she has touched. An emotional film that is a celebration of the best of human nature, a plea for kindness in a world of misfortune. 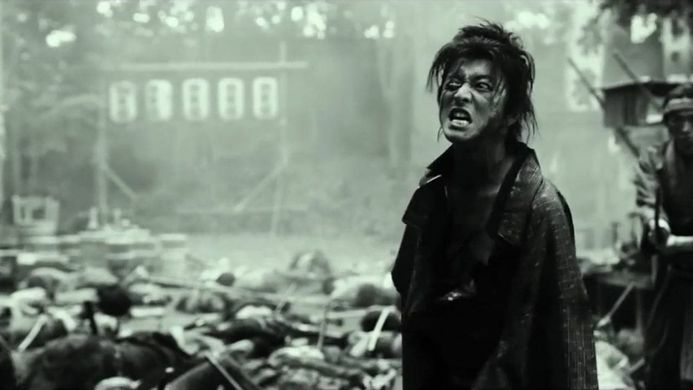 Takashi Miike’s previous forays into the samurai genre, in the shape of “13 Assassins” and “Hara-Kiri” show a reverence for the genre which is also evidenced here in “Blade of the Immortal”. The film is based on a manga by Hiroaki Samura and follows the story of a man cursed with eternal life. In the opening scenes we are introduced to Manji, played by Takuya Kimura. He is on the run from the law after killing several constables and taking care of his sister, Machi. Manji’s immortality comes from a bloodworm given to him by a witch and it also gives him the power to recover from any injury. He also gains the less heralded ability to produce any number of weapons at will from beneath his robes. Later he comes across a young girl, Rin, played by Hana Sugisaka, who reminds him of his sister. Her own parents have been killed and Manji agrees to take on her mission of revenge. Miike clearly has a love of samurai and swordplay and there are some beautifully choreographed fight-sequences. Both large scale battles and one-on-one duels between the protagonist and the swordsmen of the Itto clan. The cinematography is as good as any classic samurai film. The opening sequences use the chiaroscuro to great effect and the use of shadows throughout evokes an atmosphere of the clash between right and wrong. There is also great use of colour, in the vibrant red of Rin’s kimono and purple of Makie’s gown (another of the Itto clan) contrasting with the black and white of Manji’s robes. Everything about the film shows a quality and attention to detail, with excellent set-design and costumes. The tone of the film flits between serious drama but also includes flashes of Miike’s black humour. In large part these are off-hand remarks, or unbelievable moments such as when a character is impaled on a number of weapons at once. The film is long and perhaps suffers a little from an attempt to replicate a manga structure. The screenplay by Tetsuya Oishi does a good job of getting a lot of information across, but could have done with a less loyal adaptation of the source material. It becomes a little formulaic when Manji is taking on the third or fourth villain to appear. However, the final triumphant fight sequence, itself an incredible feat running to almost half an hour of uninterrupted action, brings the film to a thrilling close. The fights are bloodsoaked and brutal and there is enough variety in the opponents, locations or impetus of the sequences to keep you interested, but it is clear that they are attempting to rush through several important characters without giving too much time to develop any one in particular. The relationship between Rin and Manji is poignant and enjoyable to watch, with both giving exceptional performances. The film discusses the rights and wrongs of revenge as well as the idea of the cycle of violence. In many ways Manji is the embodiment of this notion. He is trapped in life that is never ending, forced not only to relive his own mistakes, but in taking on Rin’s mission he is possibly beginning the same pattern again. He yearns for death, having grown tired of living, but is unable to achieve it. In his determination we also see his character go through a change of heart as he moves from being apathetic and wishing to end his life, to rediscovering a meaning to fight. This cyclical nature of violence is something that the film is somewhat ambivalent about. Later in the film the villain tells Rin that whether he lives or dies men like him will return, time and again. Humanity can never walk away from its fundamentally violent nature. But there is the hope that there will always be heroes who rise up to fight on the side of justice. An enjoyable swordplay epic with a heartwarming central relationship and exceptional action sequences.